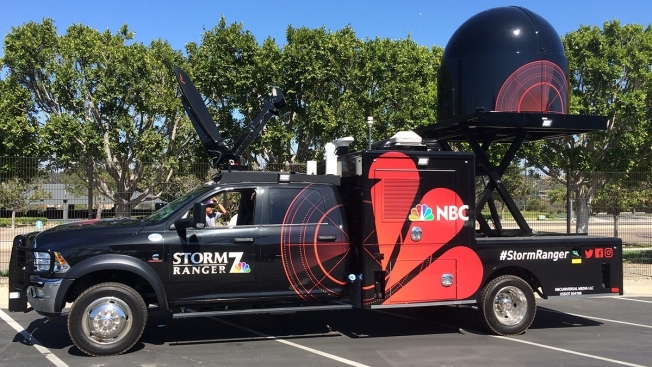 NBC 7’s exclusive StormRanger 7 mobile radar truck is a one-of-a-kind vehicle that has a live, high-powered radar that enables StormRanger 7 to get out ahead of a storm. StormRanger 7 can track storms wherever they are with a higher degree of accuracy and with more detail than ever before. During fire season, StormRanger 7 can be an asset to the public as well as fire departments and government leaders. The StormRanger 7’s X-band radar is able to detect much smaller particles than a larger fixed radar. StormRanger 7's radar, which has a maximum range of about 100 miles, will update about once every 60 seconds. These updates mean you'll be up-to-the-minute when tracking how and when the weather or fires will impact you. By driving StormRanger 7 close to storms or fires, NBC 7 will be able to give a detailed look that TV stations never have been able to do before. Fixed radars may miss certain weather events or smoke due to terrain. StormRanger 7 can fill in those gaps in coverage, and in turn provide a more complete picture of what is happening now. In addition to radar, StormRanger 7 has three cameras to give you an up-close look at conditions - one on the dashboard, one on the roof, and one pointed at a reporter riding in the vehicle.